Paint the skin weights for this character was probably the most time consuming of all the characters due to the high amount of separate joints. When I was painting the skin weights I used either 0 influence represented by the black area or 1 influence represented by the white area. When animating the tendrils of the spiral spore I wanted to rotate all of the joints in the tendrils at once so that they curved together. Doing this made animating the tendrils much quicker than rotating the joints individually and I feel it gives a better effect than animating the joints separately. I tried adding constraints to the tendrils so that I could easily select all the joints within the tendrils quickly however I did not find out how to do this so I resorted to manually selecting each joint in the tendril. When creating the idle animation for the spiral spore I wanted the tendrils feel like they are moving freely as if they are being effected by physics. To create this feel I tried to make the tendrils move with the momentum of the caps movement. This feedback is really useful as it explains in detail how I can improve my animation and I will definitely be incorporating it into my animation once I have finished the AI of the spiral spore. I agree with the points made about the swaying of the tendrils as I had trouble trying to sync the swaying of the tendrils with the movement of the cap. Rees, O (2019). Spiral spore before painting skin weights. [offline]. [Accessed 06/03/2019]. Rees, O (2019). Spiral spore after painting skin weights. [offline]. [Accessed 06/03/2019]. Rees, O (2019). Rotating multiple joints at once. [offline]. [Accessed 06/03/2019]. Rees, O (2019). Spiral spore idle animation work in progress. [offline]. [Accessed 06/03/2019]. Rees, O (2019). Spiral spore idle animation. [offline]. [Accessed 06/03/2019]. Stokes, S (2019). Spiral spore written feedback. [offline]. [Accessed 06/03/2019]. Stokes, S (2019). Spiral spore feedback pic 1. [offline]. [Accessed 06/03/2019]. Stokes, S (2019). Spiral spore feedback pic 2. [offline]. [Accessed 06/03/2019]. Stokes, S (2019). Spiral spore feedback pic 3. [offline]. [Accessed 06/03/2019]. Last week I set myself the goal of refining Belly so that he was ready for the presenting at the Bristol Games Hub. Although I was unable to fix all the issues with Belly, I managed to sort out the roll animation for Belly. During the playtest we received some really useful feedback which we can apply to the future development of the game. This week I plan to have finished all of the AI behaviours so that I can begin to block out the end section of the game. Once we have the initial overview of the level we can work out the pacing of the level and begin to refine the level design. The last enemy that needs work is the spiral spore that may be the most challenging enemy to develop due to it’s complicated movement method. One of the planned requirements for the spiral spore was to create movement that felt “floaty“ during the jump and glide movement states. To achieve this feel I reduced the gravity scale of the spiral spore when the character is falling. Although this solution works, it doesn’t give my intended effect because it reduces the launch velocity due to the falling state being active as soon as the player leaves the ground rather than activating the falling when the player is moving towards the ground. When creating the rig for the spiral spore I decided to split the cap into two halves, the front and the back so that the groups of tendrils can be moved together. This allows me to animate the cap easily if that is needed. Rees, O (2019). 04 03 2019. YouTube [video] 04 March. Available from: https://www.youtube.com/watch?v=vY_uep23p3k&feature=youtu.be [Accessed 06/03/2019]. Rees, O (2019). Creating “floaty” jump for the spiral spore. [offline]. [Accessed 06/03/2019]. Rees, O (2019). Floaty jump when falling blueprint test. [offline]. [Accessed 06/03/2019]. Rees, O (2019). Separate tendril connectors for the front and back of the head. [offline]. [Accessed 06/03/2019]. Rees, O (2019). Completed rig with the tendrils. [offline]. [Accessed 06/03/2019]. Rees, O (2019). Rig naming conventions. [offline]. [Accessed 06/03/2019]. Today I spent the majority of the day building versions of the project ready for play testing at the Bristol Games Hub Anti-Social event. This event served as a good opportunity to display Portobelly as there were many game developers at the the event ranging from hobbyists to those within the games industry. This opportunity was far more valuable than playtesting to those in our class because those at the Games Hub had never played our game. When Belly is bouncing allow the player to override the bounce with a jump to give the player more control over the character. Add squash and stretch to Belly. Add more movement based mechanics, weight play (getting heavier when you get larger). Make sure you can’t kill the mushroom (the villager mushroom you have to follow at the end of the build). Hold the players hand a bit more when introducing new mechanics (like the slam). The waterfall section could include an example of the waterfall in non challenging environment to teach the player the mechanic. Combine character abilities into the same button mapping so the player uses less buttons. I feel the most important piece of feedback from these points is the first one about overriding the bounce as it effects gameplay and it was bought up the most during the playtest. I plan to implement this feature as soon as possible since it was causing a lot of players problems. A lot of the other pieces of feedback can be completed during the polishing stage of development as they are only minor changes that would enhance the feel or level layout of the game. Rees, O (2019). 28 02 2019 Games hub playtest. YouTube [video] 04 March. Available from: https://www.youtube.com/watch?v=9ybJvUNsx_c&feature=youtu.be [Accessed 04/03/2019]. Today I focused on the AI for the villager mushroom. This AI will be used when the mushroom runs and jumps away from the player. 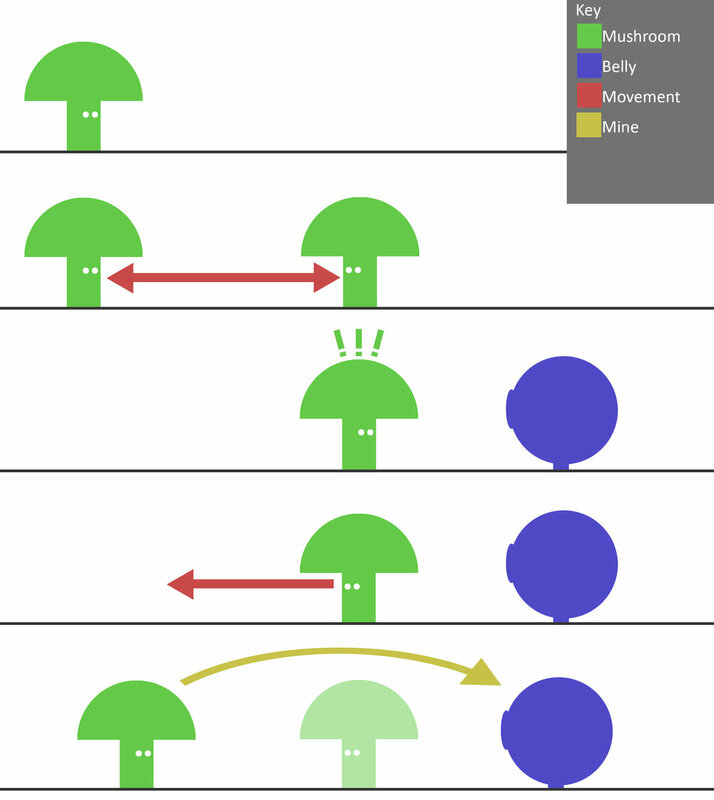 The sphere radius activates the mushrooms retreat action when the player enters the radius. This sphere radius can be changed from the editor which allows the user to adjust the distance the player has to be from the mushroom in order to activate the retreat state. I wanted to make the mushroom run faster than the player so that Belly was unable to catch up with mushroom. I decreased the acceleration of the mushroom so that the villager would gradually run away from the player rather than reaching full speed instantly. When the mushroom villager overlaps with the jump volume the villager is forced to jump. The jump volume allows the user to choose an end point for the villager to jump. The villager is launched in an arc from the start point (the initial overlap point) to the desired end point. Due to the limitations of the navigation mesh, the villager was unable to jump over the gap. I managed to solve this by increasing the size of the navigation mesh. The puddle volume decreases the bounce height of the player. We needed to implement this puddle after the jump down the cave so that the player did not perform an extremely high bounce. This puddle can be used in over areas where the player jumps from a high height. I created a vector variable that is exposed within the editor on the puddle volume so that the user can customise the size of the puddle easily. When designing levels, this should make implementing these volumes easy to adjust. When creating the logic for the puddle, rather than doing the logic within the character blueprint I wanted to contain the functionality within the puddle blueprint. When the player overlaps with the puddle volume the bounce dampening is applied and when the player leaves the volume the bounce dampening is reset. When play testing the game I discovered that Belly was unable to get through the cave entrance at full size. I only recently discovered this as when testing the level I spend most of my time at Belly’s smallest size due to the speed increase at the smallest size. This issue was fixed fairly quickly after it’s discovery. Rees, O (2019). Villager running away from Belly. [offline]. [Accessed 04/03/2019]. Rees, O (2019). Villager runaway behaviour tree. [offline]. [Accessed 04/03/2019]. Rees, O (2019). Construction script allow the user to change the size of the trigger sphere. [offline]. [Accessed 04/03/2019]. Rees, O (2019). Changes to the villagers acceleration. [offline]. [Accessed 04/03/2019]. Rees, O (2019). Villager walking into a jump volume. [offline]. [Accessed 04/03/2019]. Rees, O (2019). Villager run and jump behaviour tree. [offline]. [Accessed 04/03/2019]. Rees, O (2019). Villager unable to jump across the gorge due to navigation mesh constraints. [offline]. [Accessed 04/03/2019]. Rees, O (2019). Villager jump task. [offline]. [Accessed 04/03/2019]. Rees, O (2019). Villager successfully jumping across the bounce pads. [offline]. [Accessed 04/03/2019]. Rees, O (2019). Bounce dampening puddle with adjustable size controls. [offline]. [Accessed 04/03/2019]. Rees, O (2019). Puddle viewport. [offline]. [Accessed 04/03/2019]. Rees, O (2019). Scaling the box using the construction script. [offline]. [Accessed 04/03/2019]. Rees, O (2019). Overlap events for the puddle. [offline]. [Accessed 04/03/2019]. Rees, O (2019). Belly jumping in the bounce dampening puddle. [offline]. [Accessed 04/03/2019]. Rees, O (2019). Belly at full size is unable to get through the cave. [offline]. [Accessed 04/03/2019]. After discussion with Will (the artist on Portobelly), he felt that the camera should not the follow the player when the player is jumping as it makes the player lose track of the ground. As you can see in the GIFS above the original camera controls (on the left) follow the players Z axis location whereas with my new system (on the right) the Z axis follows the ground level. If the player is a exceeds a certain distance away from the ground the camera will continue to follow the player so that the player is always in the camera view. The camera tracking was achieved by creating a line trace below the player that finds out the distance of the ground from the centre of the player and if that distance is below a certain threshold the camera will be set at ground level. I have added a value to the distance from the ground so that the camera is always slightly higher than the ground level as when it was at the ground level the camera was too close to the ground. When working with our sound designer, he created a shrink/expand sound for Belly. Using the continuous modulation within the sound cue editor I was able to set the pitch of the sound as a parameter so that I could manipulate this sound within blueprints. This blueprint above creates the sound for the shrink and expand ability when the triggers are activated and stops the sound when the triggers are released. Based on the players size the pitch of the sound will increase and decrease creating a different sound for the different sizes of Belly. When I was trying to stream multiple sub levels at once using the previous ForEachLoop I discovered that the level streaming nodes are delayed so that they do not work using a ForEachLoop as the loop executes within a frame so that the level streaming node can’t complete multiple nodes within that time. I resolved this issue by putting the nodes one after the other. Rees, O (2019). Before camera tracking changes. [offline]. [Accessed 25/02/2019]. Rees, O (2019). After camera tracking changes. [offline]. [Accessed 25/02/2019]. Rees, O (2019). Blueprint that keeps the camera at a consistent height relative to the ground. [offline]. [Accessed 25/02/2019]. Rees, O (2019). Sound cue for the shrink/expand using continuous modulation. [offline]. [Accessed 25/02/2019]. Rees, O (2019). Sound blueprint attached to the shrink/expand input event. [offline]. [Accessed 25/02/2019]. Rees, O (2019). Manually streaming individual levels without a ForEachLoop. [offline]. [Accessed 25/02/2019].